I first became familiar with the original version of pok about 10 years ago and reviewed it for New Toys at: barryrudolph.com/newtoys/toys5/pok.html. The new pok uses a later version of Bluetooth 4 Low Energy, whereas the older model relied on a wireless USB radio link. Identical in size and equipped with the same eight paddle-like footswitches arranged in two banks of four, pok BLE is capable of storing up to 22 separate commands (in a profile) that are copies of key command shortcuts used in your computer's DAW--or actually any software program if you like. I use Pro Tools and the new pok comes with a default set of Pro Tools commands in a profile. 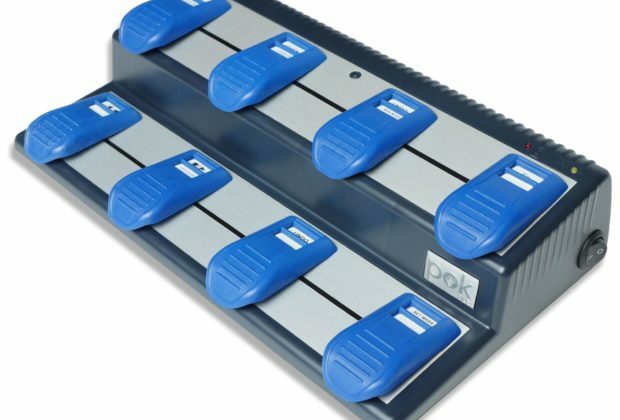 X-tempo's pok BLE comes with the pok manager software for configuring, modifying, and storing profiles. There are pok manager versions for PC and MAC as well as the instruction manual on a supplied USB drive. pok comes with three AA batteries, spare button stickers and ready-made profiles for AbletonLive, Cubase, Digital Performer, GarageBand, iTunes, Logic 8, Logic Pro 9 and X, QuickTime, and Pro Tools. If you use more than one DAW program, you can configure and stored separate profiles for each program using the manager software. Before you start a session, you can "load" the appropriate profile stored in pok profiles folder and then "write" it to pok--only one profile at a time is available on pok. But there is nothing to prevent you from storing key commands for more than one DAW at the same time using the Fn pedal--a kind of "Shift" key modifier--more later. The pok Manager software requires either Windows 10 or MAC OS 10.13 or above. I run MAC 10.11.6 and managed to install and get it all working. I did have to use an USB Bluetooth adapter, as my computer is a little old and does not support Bluetooth 4 Low Energy. I set up just eight top layer pedal commands in pok to operate my often-used shortcuts in Pro Tools. I wanted to keep it simple but more commands can be configured--up to 22 total. Each of the eight pedals has three virtual layers: the Top layer, a Double Press layer (like double clicking a mouse), and a Third layer accessed by first tapping on the Fn pedal. The pok Manager allows recording keystroke commands used in your DAW to be triggered by any designated pedal. Any pedal can be used and you can have the same command on more than one pedal if you desired. Once you have your profile set, you name and save it to the pok profiles folder and then write them to pok over the Bluetooth connection. While working on a song being able to control your DAW hands-free is important for musicians--especially guitarist or anyone who is not necessarily in front of the computer to operate it. Singers around the microphone out in the studio, self-recording musicians, hands-on producers become "feet-on" with the pok wireless controller. The X-tempo Pok BLE Wireless Foot-Controller Model PB-200 sells for $259 MSRP.